In two months the international AIDS jamboree will arrive in Durban for a four-day conference on the state of the global AIDS epidemic. The last conference was in 2014. It took place in Australia, about as far away as you could imagine from the frontline of the AIDS epidemic. Unsurprisingly it made little mark. This one takes place in its vortex. Lest you think otherwise, South Africa (and parts of the rest of the world) is still in the midst of a socially devastating HIV and related TB epidemic. In his budget speech on May 10 the Minister of Health reported great progress since the dark years of Thabo Mbeki and Manto Tshabalala-Msimang. But he also reminded South Africans that in 2014 140,000 people still died of AIDS; 7,000 children were born with HIV; and every week 2,500 young women and girls were infected with HIV. Read that again. 2,500 young women a week. In the context of SA KwaZulu-Natal, where the conference will be held, remains in the eye of the epidemic’s storm. According to the Health Systems Trust 2014/15 Health Review (a vital conference-comers guide ) in KZN in 2014 there were 951,000 people on ARVs out of a total number of people living with HIV of over 1,6 million. Over 180,000 people were recorded as AIDS sick. This one province has more people living with HIV than almost any country in the world. These are just numbers and it is unlikely that delegates to the AIDS conference will witness the acute social conditions that are driving this epidemic – that is generalised poverty, inequality and high rates of violence, including sexual violence. 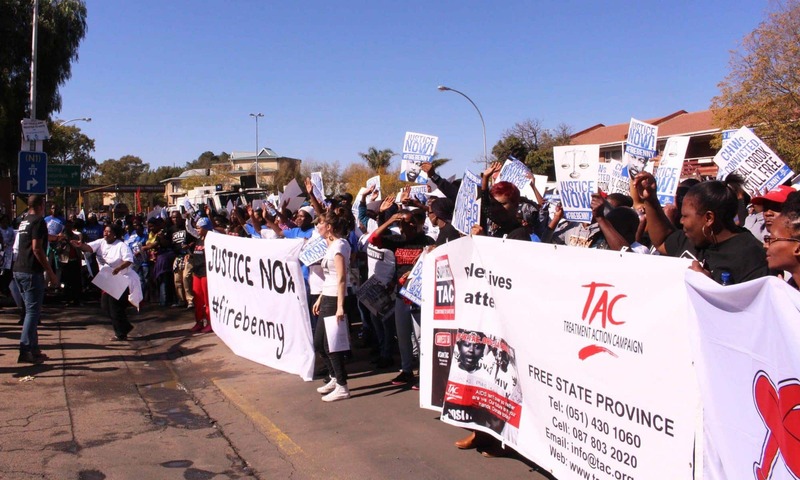 TAC and SECTION27 all too frequently receive requests for help regarding horrific sexual violence in schools. The unemployment rate amongst all young people is over 50%; nearly 500,000 children in KZN live in households where there is no employed parent; 19% of children in the province experience hunger and almost as many children as we prevent being infected with HIV may be dying of acute malnutrition. Think of that during your conference cocktail parties. These social determinants of ill health are the pathways of new HIV infections. So, what is to be done? The 2016 International AIDS conference takes place at a time when the global AIDS response is floating around in a sea of highfalutin rhetoric. The challenge we face is to overthrow this rhetoric and turn it into a concrete, plain English (or plain-any-language) agenda about what precisely needs to be done to curtail HIV in the next phase of the global response. The last international AIDS conference took place in Durban in 2000. That was the conference of Zackie Achmat, Edwin Cameron, Nkosi Johnson, 5,000 TAC marchers and a moral clamour that anti-retroviral medicines (ARVs) had to be made available to the poor of the world. It is widely agreed that what happened in those five days changed the course of the global AIDS epidemic. Durban 2016 needs to do the same. When the conference came to town in 2000 the burning issue was access to life-saving ARV medicines. According to the Draft Zero Political Declaration on AIDS 22 million people still need access to ARV treatment. This is still a critical issue. It is a sad fact that globally there are as many people would would benefit from ARV medicines now as there were people infected with HIV in Africa in 2000. Could there be a more urgent issue than getting these people on to treatment? I would hazard to say yes, there is a bigger issue and it is more complex one. Unless we can put properly trained properly paid health workers into well functioning public health systems the mid-term future of the response to HIV, and with it millions of lives, looks bleak. Why? To continue the prescription of medicines to 15 million people already on treatment and to add another 20 million people requires strong public health systems. Without enough doctors or nurses, lay counselors or community health workers there are no health systems. Already the statistics are showing that government’s failure to deal decisively with the employment of lay counselors and community health workers, will have an effect on adherence and HIV testing. There are 133 127 professional nurses registered with the SA Nursing Council, but only half (68 105) of them work in public health. In 2010, the health department estimated that the country was short of over 44,700 nurses yet we are only training around 3 500 new nurses a year. Between 2005 and 2010, provincial health departments spent R1.5-billion on agency nurses to supplement shortages. In a survey of over 3 700 nurses, over a quarter (28%) reported that they had “moonlighted” in the past year, with 70 percent saying that they did so because they needed more money. Over half reported being “too tired to work”, while almost a third – mostly women aged 25 to 34 – planned to quit their jobs within a year. Over four in 10 (43.7%) nurses are over the age of 50, and younger women are less inclined to become nurses. the world faces a shortage of 4.2 million health workers. Africa is home to only 3% of the world’s health workers who are fighting 24% of the global disease burden, with less than 1% of world health expenditure. What are we going to do about this? That is the question. Apart from AIDS a lot happened politically and economically between 2000 and 2016. The chickens of the financial boom of the early 2000s came home to roost. In particular the 2008 global financial crisis, which started in the USA, began to shift financial flows away from public goods like health and HIV into propping up profligate banks and mopping up carbon emissions. The globe didn’t change but global priorities did. Peter started to be robbed for Paul, even though Peter still had HIV. One consequence is that public health systems, on which the vast majority of people depend, have been weakened all over the world. The Ebola outbreak in West Africa was a harbinger of what happens when society allow health systems to collapse. With much sound and fury, the West responded with plasters. It is this system weakness that we must find a way to address and it starts with human beings that are needed to make a health system run. In the last 15 years AIDS activists have been able to mount enough pressure to demand funds and timeframes for life-saving drugs. There has been a revolution that has saved millions of lives. The question is can activism now do the same for health workers? The health worker crisis has to move beyond hand-wringing piety, high-level workshops and academic papers. It must be taken over and owned by the people who need health services and imposed on those who are meant to to govern on our behalf. We should demand from the World Health Organisation the pooling of financial resources for the education and training of new and existing health workers, a million newly trained health workers a year by 2020, academies for community health workers, serious attention to issues like infection control. This agenda needs urgent research and engagement over the two months before the Durban AIDS circus comes to town. If we don’t address it we might as well attend as the clowns. Finally, one other word of warning. At conferences like these stars always descend from the galaxy. Beware false prophets bearing purely bio-medical ‘solutions’ to the HIV crisis. In the last 20 years we have learnt how to partly control HIV medically. Human rights frameworks have been taken at their word and successfully used by activists to demand access to treatment for millions of people who would otherwise have died. We now know that this has given HIV prevention a huge bounce. But we have not controlled or even tamed the social and political determinants of HIV, particularly the overlapping inequalities on which it thrives – gender, education, access to health care. That ultimately is why we are failing with HIV prevention. A better response to HIV needs a better world. To change this the fourth decade of the response to AIDS requires that activists and scientists with courage ally with and join struggles for meaningful democracy, gender equality and social justice. Activists must insist on equal quality education, investment in girls and plans backed by money to stem chronic hunger and malnutrition. Politically we must push back against corruption and the tyrants who benefit from it, whether we find them in the USA, China, Uganda or South Africa. That is the only road to ‘the end of AIDS’. This is the agenda we integrate into our assessment of scientific progress, and these the issues on which we must demand results. Durban is a chance to show our colours. Mark Heywood is the Executive Director SECTION27 and Board member of the TAC. “We have not controlled or even tamed the social and political determinants of HIV, particularly the overlapping inequalities on which it thrives – gender, education, access to health care. That ultimately is why we are failing with HIV prevention. A better response to HIV needs a better world” Mark opines. I agree with this assertion.